Instead of judging our loved ones for an uncharacteristic harsh word, let us consider what they are going through. The dynamics underlying these two paradoxical sayings can be understood from a pastime in the Ramayana. When Rama was living in the forest with his wife Sita and his younger brother Laksmana, they became the target of a conspiracy by the demon king Ravana who wanted to abduct Sita. He instructed one of his demon associates, a shapeshifting wizard named Marica, to assume the form of a spellbindingly beautiful deer. It danced and pranced near Rama’s forest cottage, captivating the tenderhearted Sita. She desired the deer as a pet to alleviate the austerity of forest life. Further, when their exile ended and they returned to Ayodhya, she could gift it as a memento to her mother-in-law Kausalya. Pointing to the deer, Sita requested Rama to get it for her. Laksmana, who was by Rama’s side, peered at the deer. Where Sita saw disarming beauty, Laksmana saw disconcerting peculiarity. Remarking that the deer looked too beautiful to be real, he pointed out that other animals were staying away from it. Given that deer are not predators, such fear for the deer among other animals was suspicious. The Ramayana here points to an uncanny ability of animals to perceive things beyond human perception – an ability that some people living in, say, earthquakeprone areas sometimes testify to. Unusual behavior such as fearfulness and noisiness among dogs, horses and other similar animals often comprises a forewarning of an impending quake. Based on the deer’s unusual appearance and the other animals’ uncharacteristic response to it, Laksmana inferred that the deer was actually a demon. Sita, however, was so captivated that she neglected Laksmana’s inference and beseeched Rama again. Rama didn’t have the heart to say no to her. She had given up so much for his sake in following him to the forest, and he, being bereft of all royal resources, had been able to give her so little in return. So, he decided to fulfill this small desire of hers by catching the deer. On seeing Rama approaching, the deer took off into the forest. Rama gave chase and soon they both disappeared deep into the wilderness. Rama pursued the deer for nearly an hour. Whenever he closed in on it, it would escape by taking a giant leap, far bigger than what any deer would be capable of. Or it would just mystically disappear and reappear at a distance, as if teasing Rama. Tiring of its many tricks, Rama concluded that Laksmana had been right: The deer was definitely a demon in disguise. Angered at its deception and wary of the danger it posed, he abandoned his plan to catch it alive and decided to instead kill it. Taking careful aim, he shot an arrow at the deer. Pierced mortally, the deer fell. The demon’s shapeshifting abilities deserted him and he relapsed into his normal form as Marica. Despite being fatally wounded, he summoned whatever residual abilities he had and imitated Rama’s voice, calling to Laksmana and Sita for help. His loud call resonated for several miles all around. On hearing the call, Sita became overwhelmed by anxiety and agony. Laksmana remained undisturbed, having full faith in Rama’s ability to deal with any danger. He reassured Sita that the voice was not of Rama but of a demon impersonating as Rama. But because the impersonation was so good, Sita didn’t feel reassured by Laksmana’s words. Instead, she felt agitated by his actions or, more precisely, by his inaction. 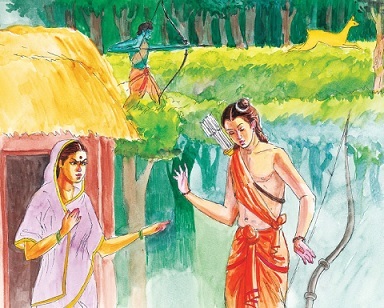 Fearing that Rama might be in danger – a danger that might degenerate to disaster if he was not helped – she urged and begged Laksmana to go to Rama. On seeing her brother-in-law unmoved and unmoving, she felt desperately driven to somehow trigger him into action. In a frenzy of anxiety, she uttered words that cut Laksmana deeper than had the sharpest arrows of the fiercest demons in the toughest of the battles he had fought. Sita insinuated that he had lusty designs towards her; he had come to the forest just to wait for an opportunity to act on those designs; and he was refusing to go to Rama’s help so that, with Rama eliminated by the demon, he could have his way with her. Shrieking that his evil designs would never succeed, she declared that she would rather die than be touched by Laksmana. Sita’s words shocked Laksmana. When he had always venerated Sita like his mother, to be accused of having lusty intentions towards her was horrifying. Further, he had the heart of a warrior who loved a good fight. Yet on Rama’s instruction he had subordinated his martial instinct and accepted the role of a passive guard for Sita away from the scene of action while Rama played the role of the heroic warrior who bested demons. Despite having exhibited such dutiful subordination again and again, to be accused of doing nothing – and doing nothing so as to further his lusty desires – was excruciating. Most of all, Laksmana loved his brother so much that he would have without even a moment’s hesitation laid down his life for Rama’s sake. To be accused that he was knowingly and intentionally staying passive while Rama was being killed was totally unbearable. Laksmana knew that Rama was in no danger and that Sita would be put in danger by being left alone. Yet he could see no other way to stop Sita from hurling any more unbearable accusations at him, so he left her and went to search for Rama. Before departing, he drew a circle around the cottage, invested it with mystic protective power and requested Sita to stay within it. Then he departed, following his brother’s trail deep into the forest. Soon, he met Rama who was rushing back towards the cottage. On seeing Laksmana, Rama immediately reproached him for having left Sita alone and unguarded. Laksmana explained the words with which Sita had goaded him to leave. But Rama brushed them aside, telling Laksmana that he shouldn’t have taken so seriously her sentimental words spoken under anxiety. Put another way, Rama essentially stated: Don’t ascribe ill-intention to what is spoken in tension. Rama’s words helped Laksmana to calm down. They both realized that a conspiracy was afoot. The demon’s taking on a deer form to captivate Sita, its evasive flight into the forest to take Rama far away from Sita and its final cry in the voice of Rama to get Laksmana away from Sita had all been parts of a scheme to make Sita alone and defenseless in the cottage. Her harsh words to Laksmana had unwittingly furthered the conspiracy, as had Laksmana’s reaction to those words. Realizing the great danger Sita would be in, they both rushed back to the cottage. But it was too late; she had already been abducted. Sita and Laksmana are transcendental, being intimate associates of Rama – by their actions, they assist him in his pastimes according to his divine plan. So, rather than judging whether Sita was wrong in speaking those hurtful words or whether Laksmana was wrong in taking those words too seriously, we can focus instead on how we can choose carefully our words and our responses to others’ words. In the backdrop of this pastime, let’s revisit the two starting sayings about the power of words. The saying “words can never hurt me” can be seen as an exhortation to the injured party to not take hurting words too seriously. The saying “words hurt more than swords” can be seen as an exhortation to a potential injurer, the person about to lash out verbally. At different times amidst life’s vicissitudes, we can be either the injured or the injurer. So depending on context, both these sayings can guide us. Life’s unpalatable reality is that, no matter how nice we are to people, they will sometimes speak hurting words. When such words come from our loved ones, they often hurt much more than when they come from our antagonists. Pain is often a function of expectation and preparation. When we expect a punch, we steel ourselves against it – the punch still hurts, but the hurt is decreased by our preparedness. However, when we expect a pat and receive a punch instead, the punch catches us unawares and hurts us more. Similarly, when we are with our antagonists, we expect hurting words and steel ourselves against them. But when we are with our loved ones, we expect kind words. When we receive harsh words instead, those words sting intolerably, as happened with Laksmana on hearing Sita’s accusatory words. Still, we can prevent passing words from causing lasting ruptures in our relationships by meditating that words spoken in tension seldom reflect intention. Tension often makes our head lose the battle with our tongue. And we end up speaking hurting words without really meaning what we are saying. Just as we are prone to this human weakness, so are others. Just as we would want others to excuse us for such lapses, we too should excuse others’ similar lapses. A more pertinent question is: Should we be judging others based on the contents of the smokiest chambers of their heart? Would we want others to judge us by that standard? We all are contaminated by many past negative impressions, and we live in a culture that further contaminates us. So, dark thoughts may surface within us even against our intentions. The Bhagavad-gita (3.36) mentions that there exists within our psyche something that impels us forcefully towards actions that are against our intentions. If people were to be judged and condemned for the dark thoughts that might pass through their minds – thoughts that occasionally come out as words – then we would probably have to condemn ourselves first. So, if someone who is usually kind-hearted suddenly speaks something harsh, we needn’t let that one outburst overshadow the past track record. Why let a potentially lasting relationship become a hostage of one verbal lapse? By the arrangement of nature and ultimately of God, we can see only others’ expressions and actions, not their thoughts. This barrier in perception serves as an essential protector of all relationships. If everyone could see everything that passed through everyone’s minds, everyone would be shocked by the unworthy thoughts that incidentally pass through others’ minds, thereby making any relationship almost impossible to sustain. The barrier between our thoughts on one hand and our words and actions on the other hand provides us room for selfregulation, for restraining our lower side and expressing our higher side. Thus, we can attain self-mastery and gradually bring out the best within us. If we are on the verge of speaking without thinking, we can create a pause button for ourselves by, say, counting till ten or, better still, chanting the holy names of God ten times. If anger keeps choking us internally, we can vent it out in a journal, thus getting it out of our system without scorching others, as it would if spoken directly to them. Getting the anger out of our system will calm us down. Then we can revisit what we have written and use our intelligence to evaluate whether our anger is justified. If it is, we can determine the most appropriate way of expressing it so that we can help in clarifying any misconception and rectifying any misdemeanor. The point of relationships is not internecine condemnation, but synergistic elevation. We are not here to see through each other; we are here to see each other through. Keeping this cooperative focus in mind can make our relationships symbiotic, not antagonistic. Such a vision of relationships based on mutual cooperation is easier to sustain when we study scripture and internalize a spiritual vision of life. When we understand that we are eternal spiritual beings on a multi-life journey towards God, we see others as co-pilgrims on this journey. We will be together for a brief lifetime, and we don’t know what our destination will be thereafter. From this long-term perspective, we can see other’s occasional harsh words as accidental –something like an unintentional elbow jab while traveling in a crowded train. No doubt, harsh words from loved ones cut far deeper than does an elbow jab. And overlooking them is far tougher because the doubt lingers that some ill-intention might have been lurking somewhere. When we have been badly hurt, we may need to convey in some appropriate way the magnitude of the wound and the gravity of the wounding words. Further, the healing of our emotions and the restoration of our trust may need time – time during which the hurting party demonstrates the absence of any ill-intention through consistent actions. Depending on the situation, the specific measures we take to help heal the relationship may vary. But underlying these varying specifics is the common denominator of the willingness to let go off the past. By holding on to something that someone might have unintentionally spoken during a tense situation, we poison our consciousness and paralyze our capacity for loving interactions. By choosing instead to focus on the good side of our loved ones and overlooking any uncharacteristic lapse, we can preserve the steady relationship that can help bring out our higher side – and the higher side of others too. Further, by practicing bhaktiyoga regularly, we can bring God into the center of our lives and our relationships. Then we can see others as connected with God and see all interactions as opportunities to grow in spiritual devotion. Acting with this vision, we can not only improve our relationships with others but can also increasingly relish our supremely fulfilling relationship with him. By focusing on God and how we can best serve him, we can choose words and actions that are growth-inducing. Even if such choices seem demanding, they will be fulfilling. Sita and Laksmana, despite their distressing interaction, were centered on the service of Rama. And by keeping his service at the center of their lives, they were able to put aside this terrible interaction and move on in their relationship. Sita and Laksmana met again at the end of the climactic war against Ravana’s vicious hordes. Neither Sita nor Laksmana mentioned their traumatic parting. Even before that, neither of them blamed the other for what had happened. Laksmana recognized that what Sita had spoken out of trepidation, not suspicion – and let her words pass. So can we.